The Congressional lines proposed by the special master. MANHATTAN — A federal judge has proposed new congressional lines that would keep Rep. Charlie Rangel's district anchored in Harlem — but shift the historically black district to become even more Latino. The proposed map, released Tuesday, comes after state legislators failed to reach a deal on how to recarve the state following the once-in-a-decade census count, which cut two of New York's congressional seats. 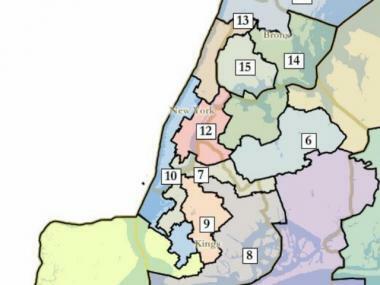 While many had speculated that Rangel’s district would be pushed north into Westchester and the Bronx, the new proposed map would keep the long-time incumbent in Harlem. Under the reconfiguration, Rangel’s new 13th District would include Washington Heights and Inwood and more of the southern Bronx. It would become 55 percent Hispanic, 12 percent non-Hispanic white and 27 percent non-Hispanic black, according to numbers released with the maps by the U.S. District Court for the Eastern District of New York. Today, Rangel’s 15th Congressional District — which includes a larger section of the Upper West Side and a sliver of northwest Queens — is 46 percent Latino, 26 percent black and 21 percent white, the latest census data show. That's an 18 percent drop in the black population and a 75 percent jump in the white population from a decade ago. But Rangel campaign spokesman Bob Liff said that if the lines become law, they likely won't change much for the long-time congressman, who has already lived through three redistrictings and has lead a plurality-Hispanic district for at least the last decade. "Charlie can win wherever the lines are drawn since (people) know him and know how much he has done and can do for the district," said Liff, who stressed that he was speaking on Rangel's behalf. Rangel's office was not availble for comment. The new map does not include a plan to create a new majority Dominican district, which many city lawmakers and Latino ­­activists had lobbied to create, stretching from Washington Heights into sections of the northwest Bronx, Jackson Heights and Corona, Queens. “We’re very dissatisfied by the maps,” said Maria Teresa Feliciano, president of the Dominican American National Roundtable, which had led the efforts. “The maps totally ignore the need and fairness of representation,” she said, noting that the state is now 17 percent Latino, which should amount to five congressional seats. Given the changing demographics, if the lines stand, Feliciano said she expects to see a strong Latino candidate run to challenge Rangel, forcing two minority groups into a win-or-lose battle, which the group had tried to avoid. Others said it looks like Rangel's time is up. “I don't think that Charles Rangel has the support he had before," said Manny De Los Santos, the Democratic District Leader for the 72nd Assembly District. “I think the Latino community has woken up." City Councilman Ydanis Rodriguez, another proponent of the new Latino district, also slammed the plan, accusing it of pitting black and Latino voters against each other. Feliciano said the group is currently considering its legal options. After the magistrate considers public comments, the proposed lines will be submitted to a three-judge panel, which has scheduled a hearing for March 15, said Esmeralda Simmons, the founder of the Center for Law and Social Justice at Medgar Evers College and an expert in resdistricting. The court must order the final lines sent to the state Board of Elections before the March 20, when candidates are supposed to begin petitioning for signatures, formally kicking off the race. While both supporters and opponents stressed that the lines released Tuesday are preliminary and could still be overturned if state legislators reach a last-minute deal, Simmons said she expects them to stick, given the pressing time constraints. Several of Rangel’s potential challengers said they welcomed the judge's plan. "They did what the special master should have done and took the politics out of it," said Vince Morgan, a candidate for the 13th congressional district seat. "You can't disenfranchise one minority group for another. It does not stand up legally and morally." Morgan added the maps acknowledge the transformation that has been taking place in the 15th congressional district for a long time. "We have to understand that the 15th congressional district of our history is over. 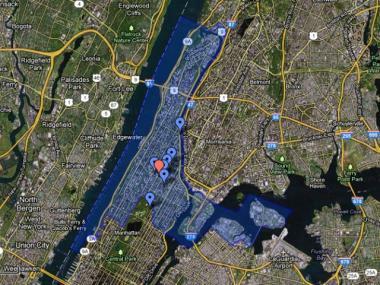 This map sends the signal that the Harlem political establishment is over with as we know it. It's just a matter of them coming to that realization," he said. "People are open to new leadership. This map reinforces the notion that new leaders are going to have to reach across racial, economic and religious lines to build new coalitions." Joyce Johnson, another candidate for Rangel’s seat, said her residence at West 96th Street and Columbus Avenue on the Upper West Side excluded from the proposed lines of the new 13th district. "I always felt that any new lines might exclude where I lived. I'm not going to say gerrymander," she said, adding that if she wins the primary, she will just move a few blocks over into the new 13th's boundaries. "This is something I knew was going to happen," Johnson said. "But nothing has changed for me." The proposal keeps the rest of Manhattan’s lines relatively similar, with one district monopolizing the East Side, one stretching from the Upper West Side down through Chelsea and Downtown, and another looping through Chinatown. Elsewhere, the seat now held by Republican Bob Turner, who won the special election to replace disgraced former Rep. Anthony Weiner, appears to have been eliminated, and a new mostly Asian seat has been created in the 6th district.